The Ritz-Carlton Dove Mountain, a luxury resort tucked into the foothills of the Tortolita Mountains north of Tucson, today was named a five-star hotel by Forbes Travel Guide. The 253-room resort in Marana joins an exclusive club: there are just 115 five-star hotels worldwide and only one other one in Arizona. Canyon Suites at the Phoenician, a swank 60-room boutique hotel on the grounds of The Phoenician resort, has been a five-star winner since 2013. 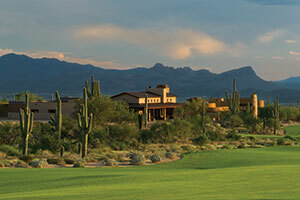 Prior to that, resort rich Arizona was without a five-star winner for a decade. Kai, the fine dining restaurant at Sheraton Wild Horse Pass Resort & Spa on the Gila River Indian Community near Chandler, retained its five-star rating and remains the only Arizona restaurant with five stars. There are 55 five-star restaurants this year. The Ritz, which became Arizona’s first Ritz-Carlton resort when it opened in late 2009, is the first southern Arizona hotel to earn five stars from Forbes or its predecessor, Mobil Travel Guide. Ritz-Carlton general manager Liam Doyle said he’s been shooting for five stars since joining the resort four years ago from a hotel in his native Ireland. The closest he got in his career was when the restaurant at a Ritz-Carlton hotel he worked for in Atlanta won five stars in 2002. To get from four stars to five stars, Doyle said, the Ritz Dove Mountain focused heavily on making sure its service is consistently top notch, from personal greetings at the valet and front desk to personal touches during the nightly turn down service such as putting jewelry left out in a bag. and beyond. The resort’s 300 employees received intensive training and were repeatedly tested by “mystery shoppers,” guests paid by the hotel to stay there and write a detailed review. Forbes says its anonymous inspectors evaluate up to 800 items, producing a detailed report Doyle said runs about 100 pages long. The Ritz, where room rates start at $500 a night in peak season and about $200 a night in the slow summer months, hopes the five-star rating brings in new business. At a minimum, Doyle says it will increase the profile of the secluded resort, which is 90 miles south of Phoenix and 30 miles north of Tucson, in a town that lacks the name recognition of a Scottsdale. Dove Mountain, a luxury master planned community, is perhaps best known nationally for previously hosting the World Golf Championships-Accenture Match Play Championship each winter at The Golf Club at Dove Mountain. “This is another piece of the puzzle that helps us create awareness that this is a world class resort in Arizona,” Doyle said.